Today's fashion post begins a new review of my latest Stitch Fix box, Fix #16. Like last month, I will review one or two pieces from that Fix per week, then do a summary post when I review the fifth piece from the Fix. For this Fix, I requested red pants, straw or crochet handbags, round handbags, handbags with circular handles, gauchos, or paper bag pants. The only item my stylist sent me out of all the things I requested was the red pants. But the pants did not look red in real life at all. They looked more burnt orange. Even my husband thought they looked orange. I know in these pictures they look red, but trust me, they were orange. Plus, they were capris. I really don't like capris on me. I don't think they suit my leg shape so I prefer at least an ankle length. So, I sent the pants back. The other item I received in this Fix was this Daniel Rainn Nadima Cutout Detail Knit Top. Out of everything in this Fix, this one was love at first sight. And if you watched any of my Stitch Fix videos on Instagram you would hear me squealing with delight when I saw it and tried it on. 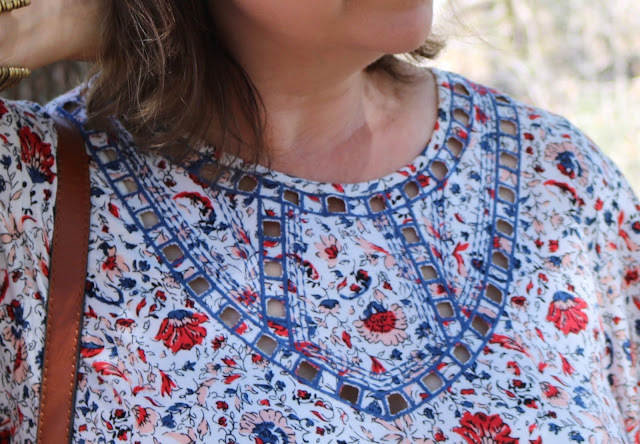 I loved how soft and loose the fabric was, and I adored all the details in this top. My stylist suggested styling the top and pants together since the "reds" went so well, so I did for the photo shoot. When my husband saw me in this outfit he was not pleased. He thought it was too "old" looking. Well, I only dress for two people in this world: me and my husband. If he really didn't like it, what was the point of keeping it? So back it went. When I look at these photos, I do see his point. It's really hard to pick out clothes when your in your fifties. I don't believe in "age appropriate" dressing..don't even get me started on how much I despise that phrase being used for mature adult fashion. BUT, I don't want to dress like a teenager nor do I want to dress like I'm old. It really is all about balance for me, but it can be difficult finding the right balance. And every woman is different. There's so many over-fifty women that can rock any look, and then there's the rest of us. I feel just like some trends can be too "young" for me, other items could make me look "older". I'm always trying to find the right balance with every outfit I create everyday. I didn't have these issues when I was younger; I could wear anything then! This top was so comfortable to wear. It was a soft jersey knit and had these really cute bell sleeves. It also had other interesting details as well like cut outs in the hem and neckline, and also a tassel tie back. The Ayden Capri Pant by Liverpool fit very well. I just did not like the color or the capri length. I was hoping for bright red pants at least ankle length. 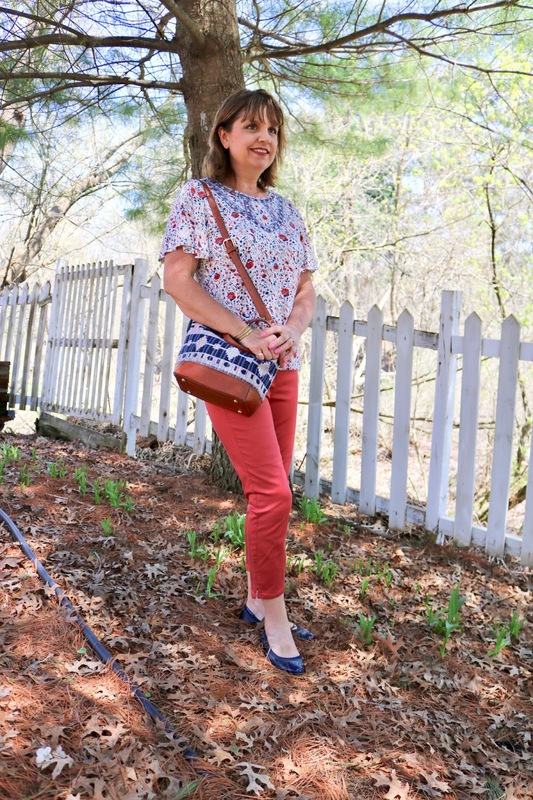 For the photo shoot I styled the pants and top with navy flats and a boho crossbody bag. So the "old lady" outfit went back in the box. Out of my last three Fixes, the item I was drawn to the most when opening the box, was not the item I ended up keeping. AND, my husband was spot on in his thoughts of what I should keep and what I should send back. Most of the items he wanted me to keep, were items that YOU wanted me to keep; like the Floral Fit and Flare dress or the Floral Gingham top. Sadly, I didn't trust my husbands opinions then and I sent them back. Now I wish I would have! I did keep one item in this Fix (I would have kept two but one of them was too expensive) and it was a item my husband loved. And it's really funny because if you saw my Instagram stories, it was an item I said for sure was going back. I'm going to trust his opinion a lot more now! I really love this pretty summer outfit! 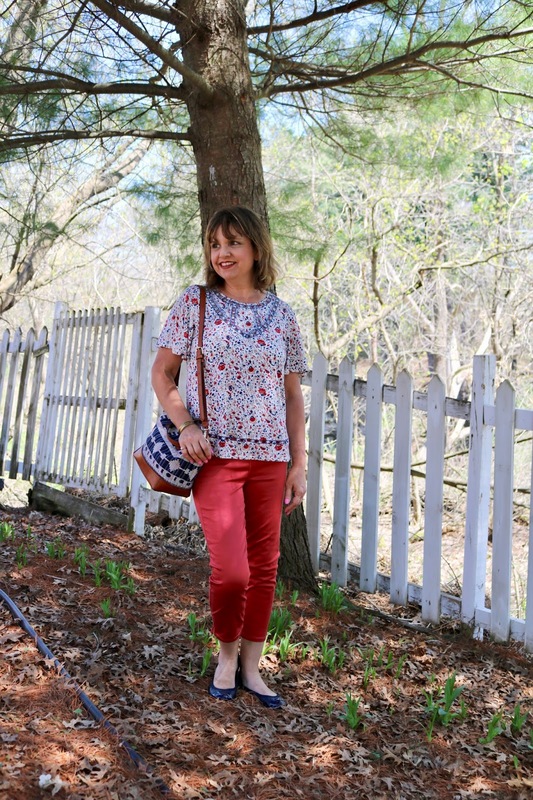 The red pants are perfect with the floral top! Happy Memorial Day! Thanks Cheryl! Happy Memorial Day to you too! Oh Amy, those red pants are perfection with that detailed top. Love this look! Haha! Oh Patti, I burst out laughing reading this comment! Thanks so much! Those red pants are cute! Well, I avoid shopping with girlfriends so I'd struggle with a complete stranger shopping for me! I do so get you with this age appropriate stuff; in my 50s I thought I should start dressing more naturally but ended up with some right frumpy stuff in my wardrobe that I can't bear to wear now in my 60s! Hugs, x.
haha! That's what I discovered too when I try to dress my age...I just end up looking older and frumpier. It doesn't work. I usually shop by myself as none of my girlfriends are really into fashion. It's why I blog...so I can connect with women of similiar interests. Most of my friends want me to go shopping with them because they want my opinion or I know where all the deals are! I usually trust my hubby too, because he sees it differently than i do!! I don't think the top looks old ladyish especially with the red pants. But I do know what your hubby means. I just saw an older lady wearing a top like this at the store. But I think if you pair it with modern jeans, it can make all the difference!! And that length of capris seems great on you!! Well, if you saw an older lady wearing a similiar top then my hubby was right! haha! But I do get what you mean about pairing it with something modern. I have a few things in my closet that I have to do that with. Thanks so much! I haven't tried the stitch fix boxes but they seem to be pretty popular these days. Like you, sometimes I feel that ankle pants look better on me than capris, though I do still wear capris. I know what you mean about finding the balance between fashion that is not too young looking and not too old looking. It's good to know others share the same concerns when it comes to fashion and styling! Yes, it gets harder and harder to dress oneself as we age and I don't think I can rely on other over-fifty fashion bloggers for much help. I find they fall in one of two categories: they dress old or they dress too over-the-top for me. 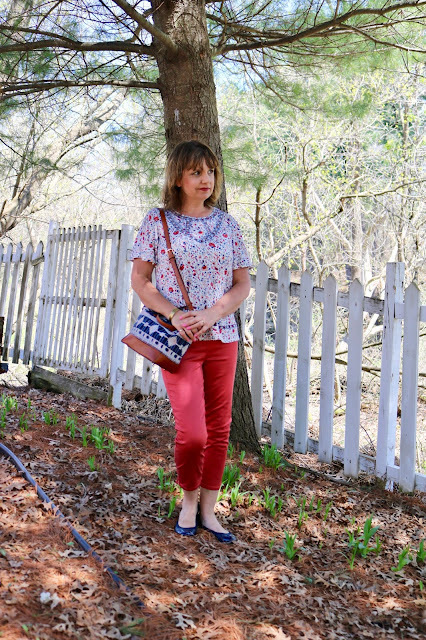 It's hard to find a over-fifty fashion blogger that dresses more balanced. I found a handful, but that's it. 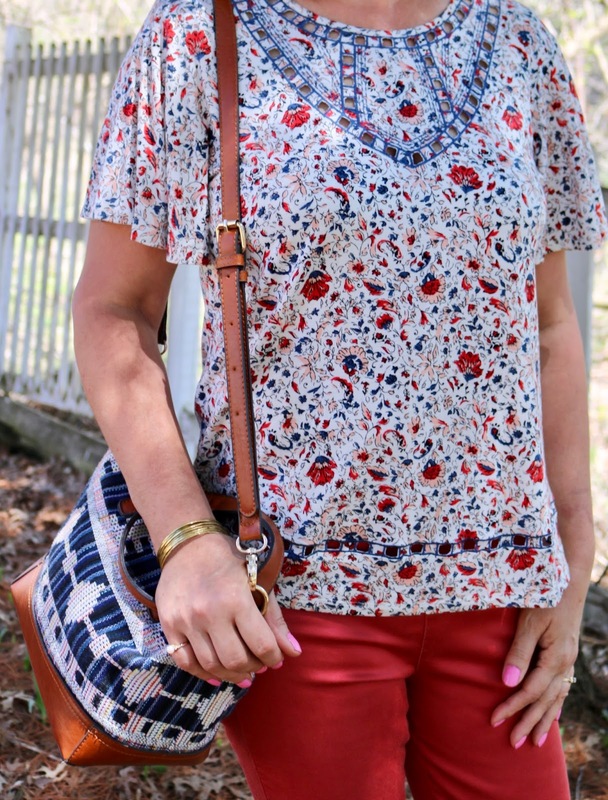 I am digging the print on that top, babe! I think my comment got lost as my internet crashed in the middle of posting...so I am commenting again. Ellie, you're exactly right! Dusty Durango is definitely the color! I did like the pants, but I really, really wanted a pair of bright red pants and I just didn't think I'd get much use out of them. As for the top, you're right about that too. There's way too much going on in this top. I think initially I liked the top because it was so soft and comfy and I was drawn to the cutouts, but the busy print really started to bug me. That blouse is just beautiful on you. I think it's the neckline that ages the blouse. The cutouts seem misplaced and that they don't belong. I do love the shape and the floral though. Thanks Ruth. Yes, like Ellie stated in her comment above, there's too much going on in this top. Detail is nice, but this is overkill! haha! I don't blame you, I side with him too! Very often I love an outfit until I see the photographs, then I'm like "WHAT was I thinking?" and often it can be the reverse result too! It's too bad the pants didn't work out! I have a pair of red pants I love to wear. I can't wait to see what you kept with this box! Well, if they were a true red, and ankle length I would have kept them! Stay tuned to see what I kept! I love capris and this lovely colour is perfect for this time of the year! Thanks Nancy. 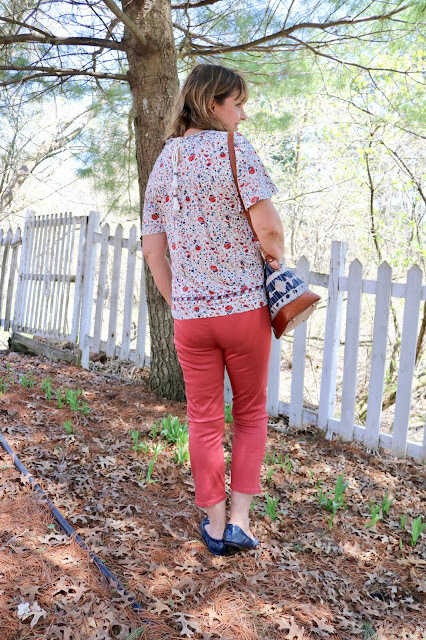 I used to wear capris a lot but I stopped because I didn't think they were any cooler than ankle pants and I did not find them flattering on me.